Can you overdo a concept or is social media perfect for serialisation? 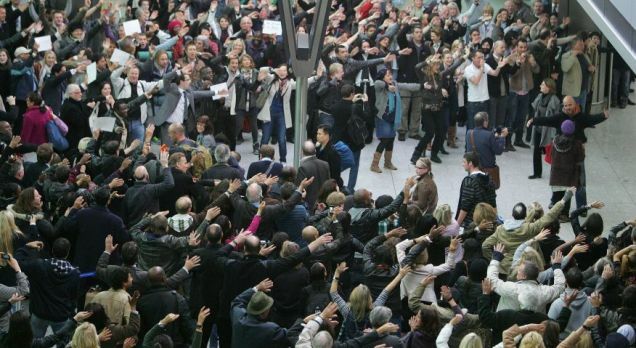 T-Mobile recently released the latest in its series of Flash Mob style adverts – a crowd of more than 500 people, including a human orchestra featuring 20 singers, greeted passengers arriving at Heathrow’s terminal 5. This is the third in the series, with other flashmobs including the dance at Liverpool Street station and the Trafalgur Square sing along, and it begs the questions – are they overdoing the concept? We all know that broadcasting companies tend to catch on to a popular format, cookery shows, reality TV, home makeover shows, and flog it like a dead horse until we can no longer stand the sight of any of the above. But does digital media allow more room for serialisation and repetition of a theme? I personally was a huge fan of the Liverpool street flash mob. It captured my imagination, made me smile and hung very closely to the tagline ‘life’s for sharing’. But when I heard about the latest offering, I did start to wonder if T-Mobile were clutching at straws here. The YouTube viewing figures do somewhat speak for themselves with 23,672.246 viewing the original Liverpool Street Station flash mob from January 2009, dropping to 3,497 for the April 2009 sing along in Trafalgar Square and 1,710,620 for the Terminal 5 ‘Welcome home’ advert. But this does need to be viewed with some context – firstly, the Terminal 5 advert was only released at the end of October, so over 1.5 million views in less than a month is pretty impressive. Secondly, viewing figures are likely to increase – when the first advert was launched using a flash mob on an advert was a pretty new concept, so it was bound to generate initial interest. The figures do highlight however, that the ads still have a dedicated following who enjoy the adverts. And I must confess that once again, when I actually watched the Terminal 5 ad, it did not fail to bring a smile to my fact. There are, however, some points of distinction that T-Mobile have effectively – each advert has its different twist – one is a dance, one a sing-along and one a human orchestra. This variety maintains interest. I just hope that they keep a close eye on when this interest starts to dwindle and finish on a high…better to be a campaign that people remember fondly than over-do a concept and undo all your hard work.